My reading lessons are for advanced and proficiency level ESL. This lesson plan is about lying, and is based on an article that discusses the ethics of lying. When and when is it not okay to lie? There is plenty of scope for discussion, with vocabulary and idioms for the students to learn as well. There is a free download of this lesson plan at the bottom of this page. Get each student to choose one, and show the rest of the class what their topic is. The students then need to take turns asking each other questions about their topic e.g. Where did you go on your last holiday? Where would you most like to go on holiday? etc. Each student needs to lie once during their turn. The other students need to guess which was the lie. What are the beliefs of Kantians, virtuists, and utilitarians with regards to lying? What is the problem with the utilitarian point of view? Why do some people believe that lying is nowadays a bigger problem than it used to be? Which of these philosophies best expresses what you believe? 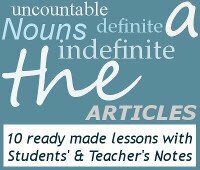 While reading through the article, get the students to underline any words they don't understand, and go through this vocabulary with them once they have completed the comprehension exercise. Cut up the following idioms and defintions and get the students to match them. Once they understand the idioms, get them to ask each other questions with them. Cut out the following headlines and distribute them amongst the students. Without telling the other students what their headline is, they need to make up and tell the story behind the headline. The other students need to make up possible headlines for the story using the phrasal verbs, and see who can get the closest to the real headline.